Let me begin this post by stating that I am against the use of letter grades as a measure of school performance. Assigning a single letter grade to a school in order to determine school worth bespeaks the disguised agenda of privatization– nothing more. Nevertheless, the grading of public schools abounds. Reformers insist that letter grades offer the public a quality identifier that is “intuitively understood” (straight from Jeb Bush’s Florida and officially introduced into the American Legislative Exchange Council [ALEC] playbook of so-called model legislation in 2010). For privatizers, the beauty of letter grades rests in the fact that no matter how the calculations behind the grades change– and no matter how the instruments used to measure “achievement change– and no matter how the numeric scaling of the letters change– the letters themselves remain the same. A, B, C. D. F. And since the letters themselves do not change, the public assumes that these grades hold a constant (and comparable) meaning: An “A” this year is “the same” as an “A” next year. A “D” last year and a “C” this year means that the grade “went up,” and that automatically indicates “improvement.” A “B” this year from an “A” last year means that the school must not have “performed” as well this year when compared to last. Not so by a long shot. There is no way to compare one year’s school letter grades to those of another year unless the instrumentation, the grading scale, and the formulas have all been held constant. No changes. No “tweeking.” Otherwise, comparisons from one year to the next are a lie. In his releasing two sets of letter grades this year– one calculated using the 2012 formula and scale and the other, using the “new” 2013 formula and scale– White inadvertently enables the public to see that the “new” 2013 school letter grades favor “moving” school grades to the middle. That is, the higher letter grades tend to “move” lower (in the direction of a “C”) from 2012 to 2013, and the lower letter grades tend to “move” higher (again, in the direction of a “C”). I discuss this false “movement” in my previous posts on the subject. In 2013 Louisiana school letter grades, any “change” that contradicts use of the same formula, scaling and instrumentation as were used for the 2012 calculation is nothing more than an artifact of applying a “new” system. Consider this graph below, composed by my colleague Herb Bassett. 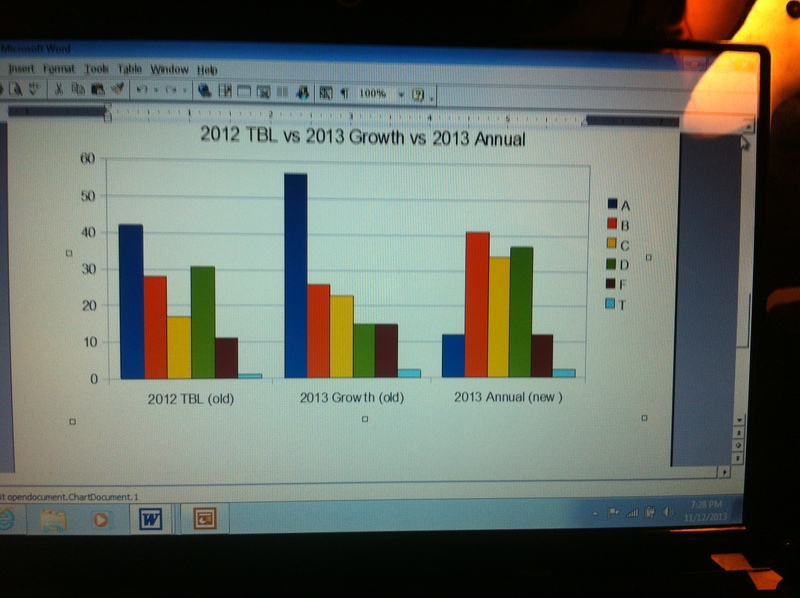 (Forgive the quality of the photo; Herb’s graph and explanation can be found here.) This graph is of schools designated as high schools. From left to right, the three sets of bar graphs correspond to 1) the 2012 high school letter grade distribution (i.e., the number of “A’s” through “F’s”; 2) the 2013 high school letter grade distribution if grades had been calculated using the same rules and scale in 2013 as in 2012, and 3) the 2013 high school letter grade distribution based upon White’s/LDOE’s “new” calculations and scale. Notice how few “A’s” the “new” 2013 high school distribution yields (the blue bar) compared to the proportion of schools graded “A” had the same rules applied in 2013 and in 2012. Notice also how “full” the middle of the 2013 “new” distribution is (consider the height of the orange, yellow, and green bars on the right as compared to the same color bars in the middle graph). Imagine what it took to produce the third set of bars by transforming the middle set of bars– imagine compressing both the “A” and (to a lesser extent) “F” categories and “forcing” the middle categories to “rise.” This is White’s game. It reminds me of squeezing a closed toothpaste tube at both ends and forcing a bulge at the center of the tube. The amount of toothpaste hasn’t changed, just the pressure applied to the extremes. Yet White will not only publicly boast of an obvious increase in toothpaste; he will attempt to sell his “toothpaste miracle” to school districts nationwide. White/LDOE also prevented 11 out of 15 would-be (under 2012 rules) “A” schools from receiving Top Gains status and the associated financial rewards. In short, the “A” schools needed to increase their scores while being subjected to a scoring system biased against “A” school score increases. (After all, increasing an “A” school score defies the 2013 system bias of scores tending toward the middle [“C”]). Thus, White/LDOE made it possible for high schools to actually improve their scores yet be penalized for “decline” solely because White/LDOE changed the measurement rules. And this capriciousness the public is supposed to “intuitively understand”? White/LDOE have decided to award “bonus points’ to K-8 schools that make “significant progress with students who are below grade level.” Based upon the actual awarding of these bonus points in 2013, it seems that the best place for low-proficiency students is in what were the “D” and “F” schools under the former 2012 school letter grade rules. D and F schools are the best place for non-proficient students. School choice and vouchers should not be used to take students out of these schools, because LDOE’s data indicate that these are where students are most likely to make significant progress toward proficiency. LDOE has manipulated the Bonus Point system to skew the School Performance Scores through its three rule revisions within the last year. 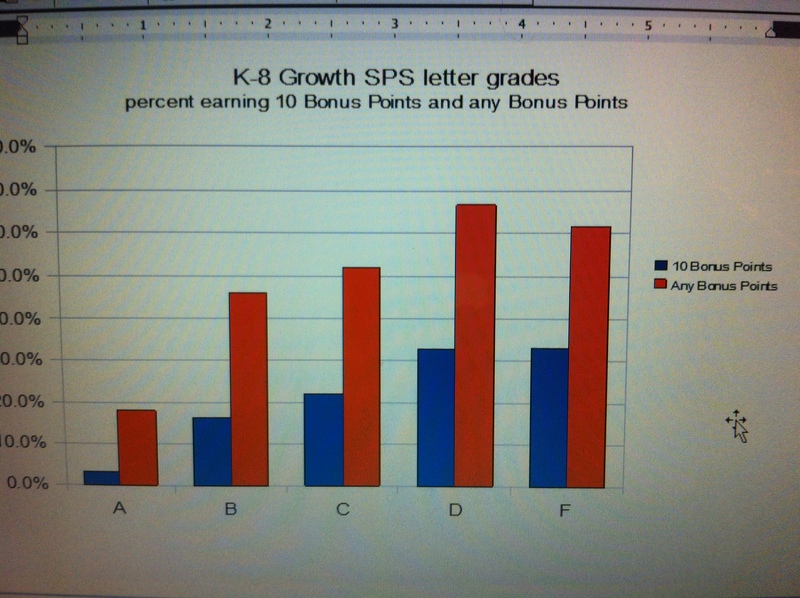 The chart shows that schools with low SPSs calculated under the old rules are given a much greater boost through the Bonus Points. This helps to explain why the new formula yielded fewer D’s and F’s. In this reformer game, the “D” and “F” schools clearly benefit. However, with all of the reformer cries about “failing” schools, one might wonder why White/LDOE would obviously bias school performance scoring criteria in favor of “failing” schools. I have three letters for you…. Here is my hypothesis regarding the reasons behind the 2013 scoring bias illustrated in this post. First, the bias against “A” schools from the 2012 to the 2013 school letter grade calculation and scaling is designed to dull the shine on these schools. After all, state-run RSD in New Orleans– the supposed “miracle” worthy of nationwide emulation– looks bad by comparison. The RSD dream of surpassing those non-state-run school districts is dust. It has been eight years since the post-Katrina takeover. Eight years and RSD is no “A-B” district. Therefore, systematic reduction in the number of “A” schools serves to make RSD appear better. That’s the squeeze on one end of the tube. There is a second maneuver in the 2013 school score calculation and scaling, and it is necessary in order to give RSD the appearance of progress: Artificially raise the 2013 scores of schools rated “D” and “F” in 2012. Since such low-graded schools abound in RSD, the “new” 2013 scoring rules cannot help but benefit it. That’s the squeeze on the other end. The result: We have the likes of John White peddling his RSD Miracle to any unsuspecting district that doesn’t bother to examine the situation closely enough. So what if other schools and districts are casualties in this letter grading lie. It’s every RSD for itself. My favorite result of the latest tweeking is how D and F schools are now the best places to theoretically send students behind grade level, but those are also ones we are supposed to close. Up is down now! F is the new A! A marvelously clear analysis and a plausible hypothesis, Mercedes. New Mexico schools have been under the letter grade system for 2 years now….of course it is controversial, unfair, and intentionally damning on our schools and teachers. I work and live in the neighborhood of a school that has received an “F” for the past 2 years. Both my children attended this school-my oldest now has 2 graduate degrees and is a librarian at the Metropolitan Museum of Art in NYC and my daughter just graduated from the Chicago Institute of Art despite going to a “failing” school!!!! In addition, a new state wide teacher evaluation system was imposed on teachers in our state this year. Without going into gory detail, the evaluation system has incited much anger throughout our state as 50% of our evaluation is based on student progress on tests OR the teachers’ schooI grade. I am trying to use the data from our Public Education Department and AIMS, our APS data system, to correlate our district’s elementary school grades and their respective Free and Reduced Price Lunch rates. The reason I wanted to explore this is because the failed economy has further ravaged our children in our poor state and I am highly suspicious that the “failing” schools are really our poorest schools. Albuquerque Public Schools has 90 non-charter elementary public schools, none of whom received an “A”. Only 3 elementary schools received an “A” in our state. The information was fairly quick to put together. I went to every elementary school’s demographic page on AIMS, divided the number of kids on FRPL by the total number of students at that school, and attached that percentage to the school’s grade. I added the percentages of each letter grade category and divided that by the number of schools in that letter grade category. Following are the results. * There were NO high poverty schools (80-100%) in the category of “B” schools. Could you please let me know if I made a huge error in figuring this out???? I also did a similar computation where I added all FRPL kids in a letter grade category and divided that by the total number of kids that attend the schools in that category. The percentages were slightly different than the ones above but not by much. Blue, your findings complement other work I have both read and conducted in correlating both school letter grades to socioeconomic status (SES) and graduation rates to SES.